We just came back from the The Victorian Tudor Inn, a stay I will not forget. From the moment we arrived to the moment we left, everything was delightfull and Richard was so caring and nice. The rooms were so comfortable and warm and the private baths beautiful and large. The decor and the cleanliness superb and the food, was delicious. I have not eaten or enjoyed myself as much as I did here and I certainly look forward to returning. In fact this was a second visit as we stayed here this past summer. We thought it was perfect then, but the Innkeeper continues to add new things to make it even more desirable. For example, our suite had a new HD flat screen TV. If you are looking for a wonderful get-a-way I strongly suggest The Victorian Tudor Inn. 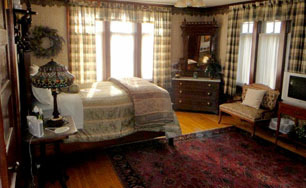 The Victorian Tudor Inn is the BEST B&B we've ever experienced. The building is gorgeous and elegant. Bedrooms are huge, comfy, beautifully decorated, and romantic. 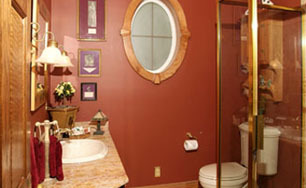 The Bathrooms are enormous, have jacuzzi tubs, and are outfitted with great toiletries and really soft spa robes and towels. The Innkeeper "made" our stay; he's warm, helpful, and a fabulous cook. We have stayed at B & B's around the world and this was the best overall experience we have ever had, customer service, attention to detail, and value and an innkeeper who knows the meaning of the word "class". 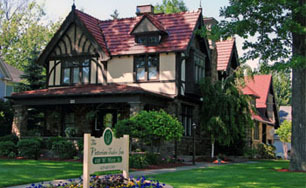 My husband and I decided to do a romantic holiday weekend early and based on its wonderful website we selected The Victorian Tudor Inn. It was simply wonderful. We were so impressed with its furnishings; some of their antiques we have never seen before and they all flow so well together. The holiday decorations; which are just gorgeous - are a grand mix of old and new. We really felt like we were in a upscale, luxurious lodging facility - because we were! Our suite was one of the best we have ever stayed in, so fresh, clean and quiet. We peeked in on some of the other suites and they were just as nice. The Innkeeper is gracious and very professional. And the waffles he makes from scratch are out-this-world - so delicious. Overall, we rate our stay a 10. I would add the Inn is even better than their wonderful website pictures! We have been going to northern Ohio at least twice a year for the past 10 years. I have stayed at some nice and not-so-nice Inns, B & B's and motels and finally found the perfect place. 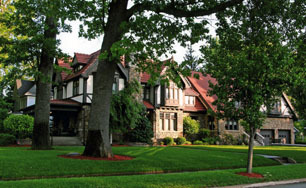 The Victorian Tudor Inn is close to many places we love. And even on on a highway and a Main Street the rooms are surprisingly quiet at night. My partner and I have stayed there twice now in the same room and loved our stay each time. The breakfast is one of the best and most varied that I've had (fresh baked muffins, bagels, great whole grain bread, fresh fruit, juices, milk [2% & skim], omeletes, amazing waffles) The rooms are clean and well-maintained with an amazing decor and wonderful antiques. Plus these rooms are not small. Rick is always available with helpful advice for activities, recommendations for restaurants and just to chat pleasantly. We highly recommend. What a lovely Inn. We very much enjoy bed and breakfasts and this has been one of our most enjoyable stays, EVER! 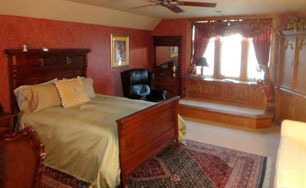 This B & B is beautiful with amazing rooms, large bathrooms and ohhh so comfortable beds. We chose it because of the wonderful website, the great comments and its convenient location - so near to so many great places. Being a new B & B we were a little leary - but we didn't need to worry. The Innkeeper (quite a gentlemen and host) knew what he was doing when he spent years of research before opening his Inn. My husband and I feel fortunate to have discovered this wonderful Inn. My girlfriends and I have been coming to this area of Ohio for the last few years for some R & R before the summer ends. We have stayed at some nice B & B's, but The Victorian Tudor Inn clearly the most wonderful Inn we have stayed at. It is so beautiful and the decor is impeccable. Our suites seemed to have been prepared for royalty and in fact we were treated as such. Each morning I did not want to roll out of the amazing bed, but I wanted to have to some of that great breakfast, with candlelight no less. The Innkeeper, Rick, was such a gentleman and so attentive to our needs. We will certainly be back each summer. In fact we are trying to schedule a holiday retreat for December as this Inn will be so amazing with all of its decorations out. We live in a city with dozens of B & B's, and have friends that own them - so we are familiar with them. 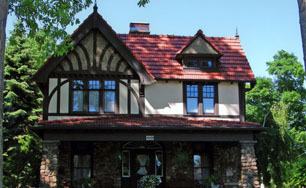 And The Victorian Tudor Inn is a excellent example of an upscale Bed and Breakfast. 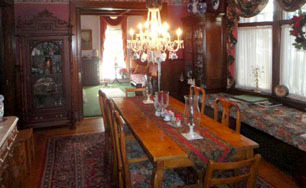 It is so nicely appointed with antiques that have a warm, cozy "at home" feel. The rooms are large and the bathrooms are wonderful. The house, fixtures, HVAC systems have all been maintained properly and worked well. No leaks, creaks, or other noises. And, I was mesmerized by the woodwork through out the house; wonderful craftsmanship and detail. I'm quite amazed that the Inn just opened a few months ago. 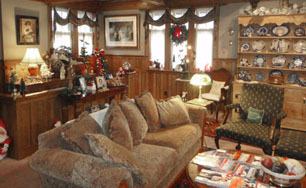 And how nice that the Innkeeper lived for years in Rhode Island - he indicates he got some of his decorating flair from the fabulous Newport B & B's - which is evident. This B & B is beautiful. Each room is a delight to one's vision. The antiques are such classics, even in the suites. 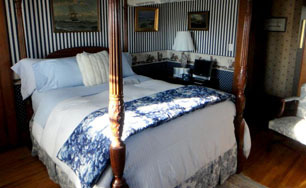 The beds are so comfortable, the Inn is so clean, and the host is so welcoming. He clearly went out of his way to assist us and insure our stay was excellent, but yet provided us plenty of privacy. I will be recommending this B & B to all my friends and family. And, the breakfasts were culinary delights, with candlelight, sterling flatware, vintage linen and antique china. And the small town of Bellevue was so pretty and friendly. We'll return to the area just so we can stay at this Inn again. 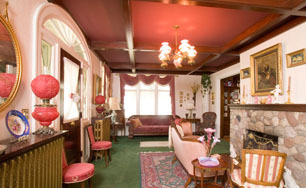 My husband Tom and I thoroughly enjoyed our stay at the Victorian Turdor Inn this weekend. Richard's taste is quite rich and runs wildly toward high quality and luxurious comfort. 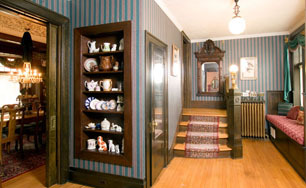 None of the well appointed rooms had the feel a grandmother's stuffy atic as some such Inns can have, but each showed the depth of character consistant with the home's history and were warm and inviting. Richard is as welcoming and personable as his Inn and we are grateful for the accommodations he provided for us. We sincerely wish him God's richest blessings and prosperity. The only thing more spectacular than the Inn, was the hospitality! 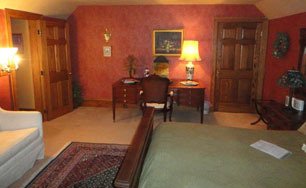 We rented the entire Inn for a work event, and Richard could not have been more accommodating.